"He adds, 'Tomorrow sings as off-key as yesterday!' There will be as much hatred as there will be love. The worlds will change, but the tune will be the same. Our prophets will have a sense of humor!" 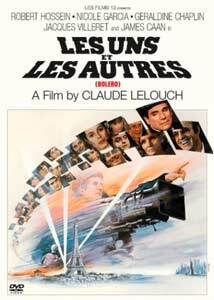 French director Claude Lelouch is the very definition of an auteur. Setting up his own production company before filming his first feature, Le Propre de l'homme, in 1960, he not only directs, but often produces, writes and edits his films. He's had a long career, and some of his films have been popular and commercial successes, most spectacularly with 1966's A Man and a Woman (Un homme et une femme), which won the Palme d'or at the Cannes Film Festival and two Academy Awards�. But Lelouch don't get no respect�at least not from the French intelligentsia. Although the popular press lauds his work, the serious critical magazines usually deride his films as being lightweight, overly-commercialized, na�ve, and anti-intellectual. And although his reputation has gone through somewhat of a positive reassessment in the last decade or so, only certain of his films are well regarded, and 1981's Bolero is not among them. Bolero is a sweeping historical epic, beginning in the 1930s and ending in the '80s. We're quickly introduced to a large cast of characters spread out over several countries. In Russia, there's Tatiana (Rita Poelvoorde), who loses a ballet competition judged by Boris (Jorge Donn), but then marries him, only to lose him to the Russian army when World War II breaks out; in France, Anne (Nicole Garcia), a violinist for the Folies Berg�re who marries fellow musician Simon (Robert Hossein)Ôbut they're Jewish and the inevitable happens; in Germany, Karl (Daniel Olbrychski), married to Magda (Macha M�ril), who becomes musical director of the occupation troops in France after playing piano for Hitler; and in the U.S., big band leader Jack Glenn (James Caan), who's sent off to France, leaving behind his wife Suzanne (Geraldine Chaplin). And we're not even halfway through! This first part of the film, which covers roughly the period 1936-1945, is followed by sections that cover the '60s and the early '80s, and each of these introduces even more characters, some of them the children of the above-mentioned, and some of them completely unrelated. By the end of the movie, there are so many faces, names, and relationships to keep track of that it distracts from one's enjoyment of the film. But it's not just the sheer number of the characters that proves annoying. The film is filled with stock situations and plot clich�s: the singer at the height of her career being undone by her own excesses, the Nazi sympathizer unjustly condemned for his past associations, the son who finds his long-lost mother after being separated by the war, the concerned teacher who protects her Jewish students from discovery by the Nazis, the French woman who sleeps with a German and is ostracized, etc. As incident piles upon incident, it becomes clear that there is no overall guiding principle or unifying element to the plot, and that this is a film that is less than the sum of its parts. The jumbled, disjointed nature of the story and thematic elements is brought out sharply by the editing and construction of the film, which frequently pair together scenes that are diametrically opposite in emotion and effect, such as happiness and sadness. And one occasionally gets the sense that minor characters have been introduced solely as puppets to reinforce this soon-predictable schematism. Besides the overabundance of characters and the muddled plot lines, there are other problems with the film. We're never more than a few moments away from another musical or dance number, and while that's not surprising given the careers of the main characters, several of the sequences seem tacked on and completely superfluous�one egregious offender being a ridiculous dance number involving combat troops, an ambulance, and a helicopter. Worst of all is the finale, a would-be spectacular performance number that somehow manages to reunite all of the protagonists, either in person or in spirit, in an apparent attempt at closure, which impresses only by its unbelievable coincidence. But the problems don't stop there. Lelouch's film frequently jumps forward in time, but rather than expressing this shift via his characters or situations, he repeatedly uses news broadcasts of world events to signal the change, which is just lazy. And the conceit of using the same actors to play both parents and their children, rather than adding resonance, distracts from the realism of the film. Certainly, there are some things to like about the film. There are some nicely-filmed sequences and interesting camera moves in Bolero, and Lelouch has proven that's he's capable of putting together satisfying films, certainly in the case of Un homme et une femme, which for all its fluffiness is undeniably skillfully constructed. Other directors (Robert Altman comes to mind) have shown that it's possible to interweave the stories of a large ensemble cast into an organic and consistent whole, but Lelouch's film ends up crushed under its own weight, and remains an unsatisfying viewing experience. Image Transfer Review: Given the age of the film, this is a reasonably good anamorphic transfer, although colors are somewhat faded and skin tones are often unnaturally orange. There's a good bit of detail, with occasional grain in darker scenes. There is some edge enhancement, and occasional compression artifacts on moving objects. Audio Transfer Review: The sound is quite good, with reasonable fidelity and bass. There are lots of directional effects, which sometimes sound artificial and are distracting, and activity in the surrounds when called for. Extras Review: We don't need any extras, and none are provided. Claude Lelouch's Bolero, a ponderous historical epic, is a jumble of plot, characters, and musical numbers that never comes together in a satisfying or coherent whole. The anamorphic transfer and sound are reasonably good.